Hailed as “brilliant” and “deeply sensitive” by Das Orchester Magazine, pianist Maria Prinz is widely in demand as a soloist, recitalist and chamber musician. Ms. Prinz has performed with leading orchestras throughout Europe, including several performances with the Vienna Philharmonic, collaborating with renowned conductors Sir Neville Marriner, Seiji Ozawa and Riccardo Muti at the Salzburg Festival. 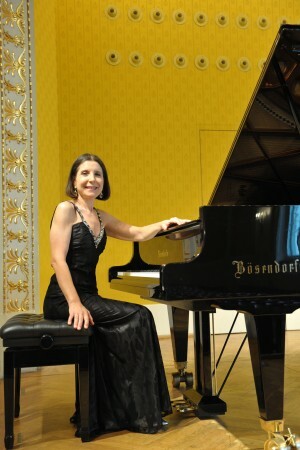 As a recitalist, Ms. Prinz has concertized in the U.S., Austria, Italy, Germany, Switzerland, Japan, Belgium, and Bulgaria, and performed a series of recitals entitled “Mozart and His Contemporaries” in Vienna, Sofia, Prague, Bloomington and Los Angeles in celebration of Mozart’s 250th birthday. She has performed at leading venues and festivals around the world, including the Salzburg Festival, Pacific Music Festival in Sapporo (Japan) and in Vienna’s Musikverein and Konzerthaus, Carnegie Hall’s Weill Recital Hall, the Purcell Room of Queen Elizabeth Hall and Milton Court in Barbican Centre and in Tokyo’s Bunka Kaikan. Her chamber music collaborations include numerous performances with members of the Vienna Philharmonic Orchestra, international artists, such as Andrew Marriner, Patrick Gallois, Philippe Pierlot and world- famous singers Ludovic Tézier, Krassimira Stoyanova and Matthias Goerne. The highlights of the season 2018/2019 are a song recital with baritone Ludovic Tézier at the Alte Oper Frankfurt, a chamber music recital with Céline Moinet and Sophie Dartigalongue at Vienna’s Musikverein and a piano recital at Weill Hall/Carnegie Hall in New York. Maria Prinz recorded Haydn and Mozart piano concertos with the Sofia Symphony Orchestra, Brahms Sonatas with clarinetist Alfred Prinz, a Chandos CD “The 20th Century Concerto Grosso”with the Academy of Sankt Martin in the Fields under Sir Neville Marriner, Mozart Violin sonatas and Beethoven Variations Op.105 and Op.107 with flutist Patrick Gallois and Puccini-complete songs with Krassimira Stoyanova for Naxos. A new Naxos CD with songs by Tchaikovsky, Rimsky-Korsakov and Rachmaninov with mezzo-soprano Margarita Gritskova will be released in March 2019. Maria Prinz was born in Sofia, Bulgaria into a musical family. Her father is the famous Bulgarian conductor and composer Konstantin Iliev. She studied at the Music University “Hanns Eisler” in Berlin with Rudolf Dunckel, in Vienna with Jörg Demus and in Paris with Yvonne Lefébure. In addition to her performing career, Ms. Prinz has taught at the University of Music and Performing Arts in Vienna since 1987.